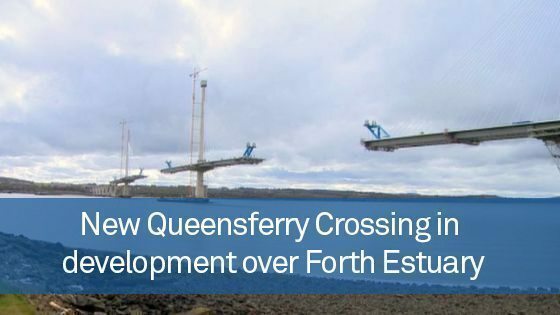 The new Queensferry Crossing under construction in Scotland will be the third landmark bridge covering the Forth Estuary. Once the new structure is introduced at the end of 2016, it will represent the third landmark bridge to be developed across the water. It will stand alongside a road bridge and the historic rail bridge. The development’s south tower has set the record for the biggest ever continuous concrete pour, with a total of 16,869 m3 of concrete being pumped into the base of the development. The steelwork for the bridge deck was manufactured in China after a deal was won in an open tender with the Chinese firm offering the best possible price for the high-quality structures. The steel deck sections were moved from China on a vessel that was tailor-made to be unloaded quickly and efficiently in order to prevent cost penalties if the move was delayed. A kingpost and cable system mounted on the towers is utilised to raise the deck sections from barges with the balanced cantilever erection method. This approach also offers a degree of flexibility, with the structure easily capable of handling large loads. Speaking to World Highways, Mike Martin, project director for the Queensferry Crossing, explained that the project remains “very much under budget”. Although estimates suggested the structure would cost roughly £1.6 billion to construct, costs have been lowered and the final price tag seems likely to be between £1.38 and £1.45 billion. Mr Martin explained that it was possible to release funds back to the Scottish Government, which helped to fund the design. Late last year, employees at the Queensferry Crossing reached a new pay deal with employers after walking out.